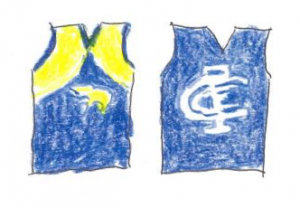 Saturday 21st April, 4.35 p.m.
A weakened Carlton hosted West Coast last Saturday, in the wake of a series of performances ranging from disappointing to disastrous. Most recently the Blues had succumbed to North Melbourne – who had previously been scarcely setting the world on fire – by 86 points. In the process, automatic selections Kreuzer, Weitering and Kennedy had joined captain Murphy (a withdrawal in the warmup in the North match) on the sidelines in a packed medical room at Princes Park. In the event, several inexperienced players, as well as some irregular starters took advantage of their opportunity and the team produced a respectable effort, which however, unsurprisingly fell short to a quite lacklustre Eagles side. Rowe, Phillips and Kerridge all had their first outing for the season in the senior team, while McKay played for the first time this year and took part in only his third match at the top level. Added to this O’Brien (2nd gamer) and Dow are first year draftees. All mentioned performed respectably or better, and significantly contributed to Carlton’s taking the game to the visitors and forcing them to slip a gear in the 3rd quarter to avoid what would have been an embarrassing defeat. The poor attendance reflected the ho hum nature of the match in prospect, and the on-field action didn’t much excite spectators, even if a degree of interest was sustained by the unexpected closeness of the scores for much of the evening. West Coast for their part did enough to ensure that they would emerge with a win. Ed Curnow marked and goaled from the opening centre clearance to register the first score of the match. Following Rioli’s snapped behind at the other end, Lycett converted Hurn’s delivery from a free kick to put the Eagles in front. Petrevski-Seton was gifted a neat pass from the durable Simpson to score the Blues’ second goal, but barely a minute later, Kennedy replied for West Coast with a snap from Darling’s handpass, after both uncharacteristically roved the pack rather than attempting a mark. This seemed to herald a field day for the forward most remembered by Carlton supporters as the price of Chris Judd’s recruitment. This goal brought him equal with Peter Sumich’s as West Coast’s most prolific scorer, and it seemed inevitable that he would take the prize during the remaining three and a half quarters of this match. In the event he was well held by Sam Rowe who was helped by rather haphazard delivery into the forward line, so he and Suma share the record for this week at least. Late in the quarter, following several behinds by the Eagles, Shuey goaled after his effective running enabled Duggan to offer an attacking hand-pass. Rebound running was a feature of their game, fuelled no doubt by collective and individual confidence in contrast to the Blues. Shuey’s major gave the Eagles a ten-point lead at the first change, as Carlton hadn’t added to their score in the latter half of the quarter. The first half of the second term was rather uninspiring, 4 behinds at either end. Mid-way through the quarter McKay marked twice within two minutes (from Silvagni, then Fisher) and registered goals each time, to give the Blues a narrow and brief lead. Rioli restored normalcy from Masten’s handball, when the superior run of the Eagles caught Carlton defence three on two. Kennedy capitalising on Petrevski-Seton’s kick into an opponent, gathered and handballed to Gaff who goaled to give the visitors a two goal break at half-time. Carlton again commenced the 3rd quarter in spirited fashion. Fisher from a free and Kerridge goaled and Wright’s behind, when he was dragged off his kick to an open goal by a timely tackle from Sheppard, again gave the Blues the lead. Wright’s score in the 7th minute of the term was the Blues’ final offering for the quarter, as West Coast took control. Initially this delivered a string of four behinds, but then followed four goals from LeCras (2), Masten and Gaff. This passage of the game was decisive, first re-establishing the lead, and then extending it to an insurmountable (for the Blues) 28 points. The final quarter played out with West Coast doing enough to keep the game in control, scoring just a single goal by LeCras – the perennial touch of class in the Eagles’ attack. Meanwhile, the youthful Blues battled away, with Casboult and McKay each scoring two goals to narrow the margin, without seriously threatening. Both McKay’s goals and one of Casboult’s came from frees (my notes suggest that Casboult’s was a rather generous call). There was also a notable example of commendable team-work by the umpires. Gorman (#10) was unsighted by a pack and called play on, but Mollison (#32) from forty metres distant had a better angle and advised his colleague of a throw, so Mollison was able to over-rule his initial call. The Eagles win was a product of superior organisation and run which enabled them to snap out of a lethargy evident in the early stages of each term. Better players were the usual suspects, Gaff, Shuey, LeCras, Masten and Yeo with support from some lesser notables Sheppard and Cripps. For the Blues, (our) Cripps was outstanding. He is a real leader whether in the formal role or not. Simpson’s durability belies his light frame, and his ability as sweeper, and his general good use of the ball by foot is indispensable. Phillips and Rowe won their duels with more fashionable opponents Natanui and Kennedy, and Dow and O’Brien showed glimpses of possibility. McKay recovered from a clanger in the opening quarter, when he merely had to lob a pass to Cripps isolated in the forward fifty and contrived to slice the ball out on the full, in a fashion reminiscent of some of my golf drives. His four goals were important, but equally significant was his role as a marking target in the forward fifty as an alternative to Casboult who had a quiet day. Mullett contributed in defence and Jones took some telling intercept marks. In the previous two weeks it has been Carlton’s fate to play Collingwood and North Melbourne into form. On that basis, perhaps Fremantle should be wary as they approach this week’s derby. Thanks for the good omen for Sunday PF. I reckon the Derby will be a great game and the winner should be finals bound. Competition for the time honoured (Insert Naming Rights Here) medal for BOG should be keen. First time I have watched a full game of PCripps. Michael Voss reborn. Swap you Jamie (MiniMe) for Patrick? Your Simpson plays a lot like our Simpson in his Kangas playing days. Tireless, clever and the ultimate team player. Harry McKay looks like a Joe Daniher that can kick. Ed Curnow still needs a couple of pre-seasons in the gym to become a key forward. Looks like the Bolton Project is on track but behind schedule. Two talls short?